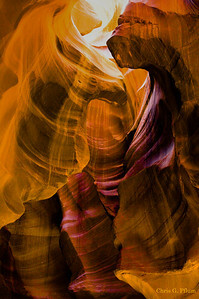 Photographed and made popular by talented photographers, such as Peter Licht and David Muench, Antelope Canyon now attracts hundreds of daily visitors. 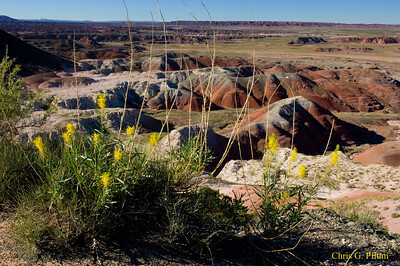 The canyon’s popularity supports 3 or more small businesses operated out of Page Arizona and owned by the Navajo Tribe. 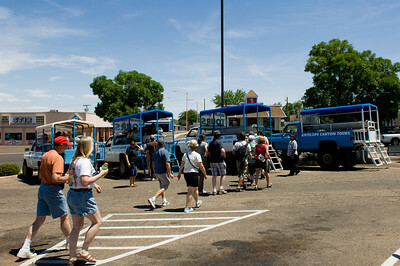 The tour costs $20.00 to $50.00, including transportation to and from the canyon and takes 1.5 – 2 hours. Considering that you will spend about 20 minutes traveling and waiting for your turn to enter the canyon, your Antelope Canyon experience will run over $27.00 / hour. As serious photographers, my brother and I signed up for the $50.00 - photographers’s tour which was touted to begin when the lighting was perfect and would include fewer people. 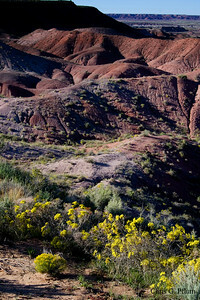 Since we would arrive before the sun’s ray penetrated the canyon, we took tripods to shoot time exposures. 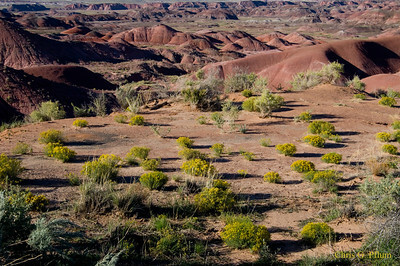 We traveled to the canyon in a modified flat bed truck that held about 10 photographers. When we arrived at the canyon, I counted 12 of these trucks parked near the canyon’s entrance. Immediately, I knew that it would be impossible to set up tripod in a narrow canyon where a hundred or more people were scrambling about. So I used a monopod and kicked the ASA up to 800. We were instructed to stay with our group leader as she rushed us through the Canyon. 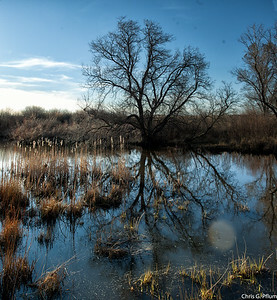 I had no time to compose my photographs or even take exposure readings. Whenever I lingered, the leader of the group behind me urged me to move on. The entire tour – from entrance to exit – took about 15 minutes after which we were given another 15 minutes on our own. During this time I managed to get a few decent shots, but to do so I had to meander through swarms of people whose arms, legs and faces littered most of my photographs. The pressure of having to constantly move and shoot photos on the fly made our visit to Antelope Canyon more like a sporting event rather than the tranquil, leisurely experience that we had expected. 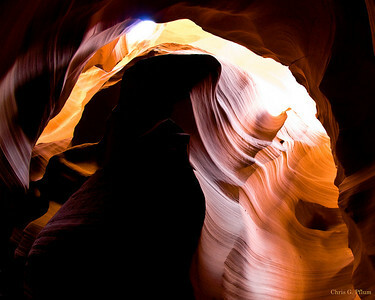 If you happen to be in Page Arizona and have nothing better to do, you may want to visit Antelope Canyon. Otherwise, the trip is not worth it. 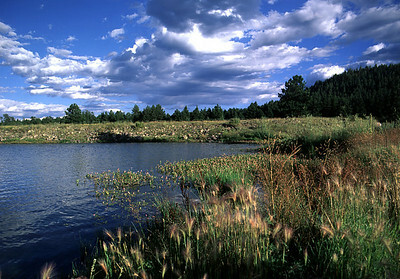 Sedona's unique geology has attracted tourists and photographers for decades. Formed from ancient deposits of limestone, mudstone and sandstone, the towering formations are now named after the objects they resemble: Coffeepot, Cathedral and Bell Rock. 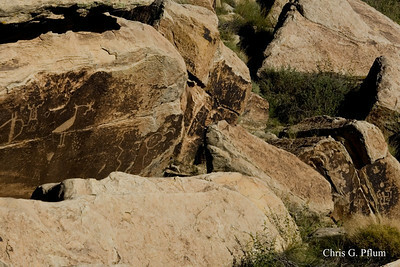 Early Native Americans traveled to these formations because they were considered sacred. They honored Cathedral Rock as the birthplace of the first man and woman because it resembles a couple standing back to back. We have enjoyed our six visits to Sedona, but each year it becomes more difficult to find the solitude that originally attracted us. 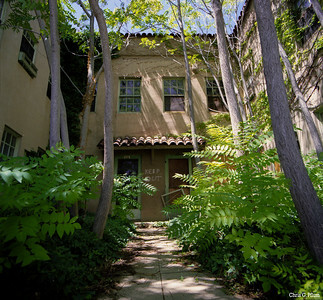 We constantly heard traffic and construction noise and often hiked trails that ended in someone's back yard. Along the trails, we met wondering merchants selling Indian jewelry or T shirts. 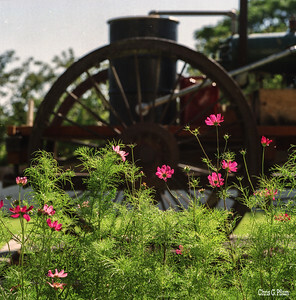 In town, time-share agencies disguise themselves as tourist information centers. When you ask them for information, they try to sell you a condo. 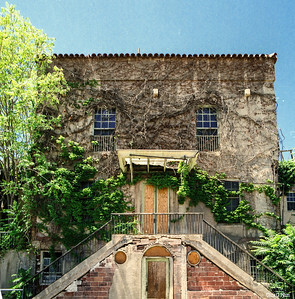 Although Sedona has now become the home of more enterprising Gods, much of its natural beauty remains. 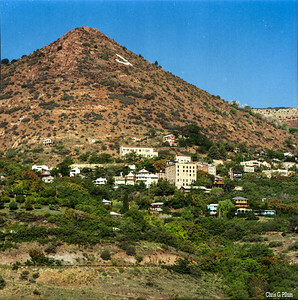 Touted as “America’s Most Vertical City” and “Largest Ghost Town in America”, Jerome AZ sits atop a 5,200 feet hill located between Prescott and Flagstaff. 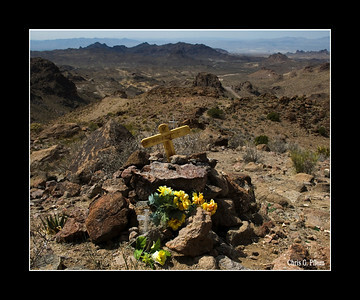 Jerome was once known as the wickedest town in the west that grew from a settlement of tents in 1876 to a roaring mining community in the 1920’s. 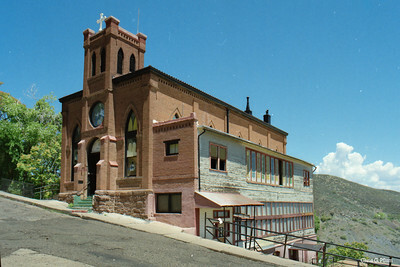 In 1967 Jerome was designated a National Historic District, and today it has become a tourist spot with a population of about 450. 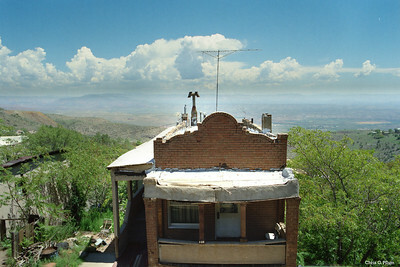 Hollbrok, AZ - This TP motel on Route 66 is on the National Register of Historic Places. 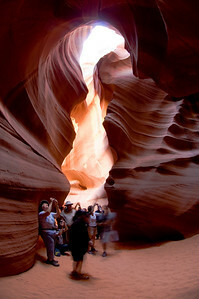 Paige, AZ - Antelope Canyon - A constant rush of people through the canyon made thoughtful photography impossible. I had no time to compose or judge the exposure. 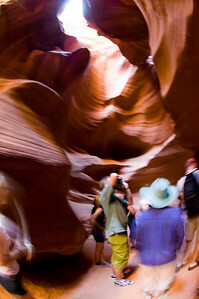 Paige, AZ - Antelope Canyon - A decent shot was ruined when people walked into my photograph (and into my tripod). 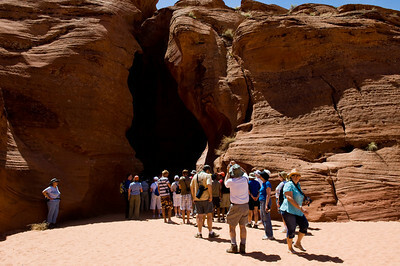 Paige, AZ - Antelope Canyon - Visitors standing in line waiting their turn to enter the canyon. 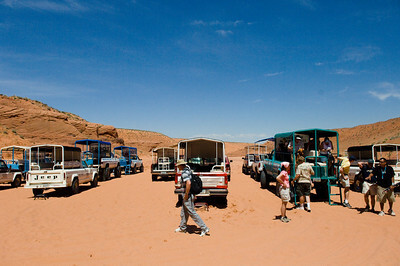 Paige, AZ - Antelope Canyon - Visitors travel to Antelope Canyon in the the back of modified 4x4 trucks. Each truck holds about 10 people. Paige, AZ - Antelope Canyon - When we arrived at the Canyon I counted 10 trucks that had just unloaded about 100 visitors. Paige, AZ - One of the few decent photos that I took of Antelope Canyon. I used photoshop to remove a few heads from the lower left corner.